"First do what you should . . .
Then do what you like." The question of "How should I train" doesn't seem like much of a problem to those who already have some experience in bodybuilding, but it does present a very trying problem to those who are just beginning to train and want to realize the most from their efforts. However, even experienced barbell men are not always sure how they should train because or the confusing statements issued by titleholders in articles they are supposed to write. It's possible some of his friends have done some training and, therefore, have their own likes and dislikes for this or that training system, which may only prove more confusing to the novice and make his while outlook as clear as mud. At this stage he doesn't know where to begin or how to start, consequently he is ready to give up before he even starts. Logical reasoning, however, should convince him that most training systems are basically sound and can be employed to advantage by most persons, but for the novice such programs are best omitted until more experience in training has been acquired. Nevertheless, any beginner should achieve reasonably good progress using only a few basic exercises, if he trains systematically and performs each and every movement correctly to achieve the greatest possible contraction in is muscles. Physical changes should, therefore, be observed in a short period of time, usually it takes but several weeks to notice this first improvement. However, two or three weeks is by no means enough to achieve the physical goal he set his sights on, but he should have improved sufficiently to realize he is on the right road to success. Another problem that might beset the novice is the type of apparatus he should employ to obtain the most benefits for his efforts, but frankly, this decision should depend on his financial status and the available training area he has at his disposal. This decision could also hinge on his preference for a certain type of equipment, but whatever the decision he should select an apparatus that can be adopted for use on all parts of the body and thus develop a strong and shapely physique. A combination of barbells, dumbbells, kettlebells and possibly pulleys will fit this bill. Additional weights can be gradually added to an outfit whenever you're ready, depending on how fast the size and strength of your muscles increases and makes demands for greater resistance. Other equipment can also be added later, if you feel you need more in your training, and if you are dextrous along this line you can construct whatever you need yourself, until such a time when you can afford better. In his enthusiasm, the novice often tries to emulate the training routine of the more experienced man whom he might observe training in his gym, or accept his training methods contained in an article written under his name. The novice doesn't realize that the author may not have considered the novice when he planned the article and certainly it was not the same system employed by him when he first started training. But most authors assume that people who read them know the difference and so, no further explanation is necessary. One has only to go back to the time when he first started and recall the anxiety that enveloped him in those early days of training to understand the confused conditions of many beginners. Furthermore, several stages of progression seem to exist; novice stage, then regular, advanced, extra heavy (lifting), or far advanced, plus definite training schemes for the weight gainer and the reducer. Most enter these phases naturally and are not bothered by the progressive stages, but for best improvement it is wise to reach and progress into the other stages separately. Beginners who make the mistake of adopting the training programs meant for the more experienced enthusiast may find improvement relatively good at first, but entirely lacking after several weeks have passed, particularly if the beginner is on the slim, nervous side, and continued efforts to follow this type of system recommended for the heavier, more experienced fellow will only debilitate him. I've had several tell me it's impossible for them to overtrain, that they have often trained five, six and even eight hours some days, and although they are tired at the finish, they feel refreshed and vigorous the next day. Such training, I know, can prove beneficial for a limited time, and invariably, if continued for weeks, can have exactly the opposite effect; an enervating and depleted condition. I admit, however, not everyone suffers similar reactions because much of this depends on the ability of the person to recuperate, his endurance and strength, and his vocation. But too much training is, by far, one of the prime reasons why so many beginners fail to make the physical progress they seek, and could be the chief cause for their nervousness, inability to sleep sound and their jittery state. Overtraining can be responsible for some or all the conditions mentioned above, and when one or more of them begins to manifest itself, that's the time to relax - take it easy. Better improvement can be had under relaxed and happier circumstances. Muscles are not developed under emotional strain or physical stress, although they are exercised under such conditions, but the actual development or reconstruction takes place during resting periods and those relaxed hours you enjoy in sound sleep. During this time the lactic acids created during exercise are eliminated from the tissue, and the blood, carrying the nutrients, repairs and rebuilds the broken down tissue back to its former size and strength - and more. If training or physical stress hasn't been beyond the recuperative ability of the individual, he should experience a pepped up feeling almost immediately after training or after a brief rest, and this feeling is always a sure sign of how effective your training was. On the other hand, if you continue to feel tired for hours after, even a day or two later, these signs should be important to you and a definite warning to ease up, slow down, relax more often and get more sleep - your system demands it. Heed the warning. It may mean the difference of continued improvement or reaching a stalemate. In some cases even the overweight man overtrains, not so much regarding his physical condition as his nervous energy, which makes him feel debilitated and could help him to conclude that 'training isn't for him.' The cause is quite simple; this type of person should NEVER train vigorously at the start, but increase it progressively as his system accustoms itself to the movements and his endurance and recuperative ability is increased. Once the body becomes accustomed to the routine, and his physical condition and endurance is improved, he can train much harder and longer, actually thrive on such a program, reaping wonderful benefits. Many beginners are fortunate inasmuch as they realize their limitations and rarely go beyond their physical limits. As improvement is made, they increase their training and provide the muscles with the increased demand they f eel is necessary and work them until a glowing warmth and slight congestion is felt within the tissues. If the muscle is worked beyond this stage, they congest more and more turgid often to the point where trembling is experienced for hours after. It's harmless to reach this stage once in a while, but if persisted in constantly, some damage could result to the nervous system. The best way for anyone to train, especially the beginner, is to follow an all-round training program, a variety that includes exercises for all parts of the body. It could be this reason why many beginners actually make very good progress at the start, but the minute they begin making changes in their training schedules, improvement seems harder to achieve. Could it be the fact that some of the important exercises are discontinued and others, less important to his system are included, make this difference? Personally, I've always suspected this, but not enough actual cases have been tested along this line to reach definite conclusions. However, another potent reason is that most novices follow a complete program without 'specializing on this or that muscle' or concentrating on developing one isolated muscle group. As a whole they work all the muscles, fully, systematically and, apparently, get better results. Once specialization is introduced, many find their progress is checked or slowed down to a discouraging pace, and even redoubling of effort fails to jar this obstinate stage. Include a complete training routine and then, after you've completed that, specialize or devote additional time, energy and exercises to those parts that are below par or require more development. However, in reducing, 'spot specialization' or the exercising of certain areas only is ideal, since greater energy can be devoted to such parts. For example, if your waist is excessively large for your other proportions, include about three training periods for all body parts a week, but at the conclusion include at least three or more extra exercises for the waist. On alternate days only such exercises should be done that will help reduce your midsection, since it is always a good plan to continue working overweight parts every day until the desired reduction is obtained, but only after your body has been conditioned to allow everyday training. Increasing muscular and reducing fatty areas are quite different; rarely can one do 'too much' for an overweighted area, if one is conditioned to train quite hard, but 'too much' exercise can be done if one is anxious to gain weight and develop his muscles Therefore, it's never the best plan to train every day if increased size and strength is desired, although some lifters train every day for a while, but then several days of rest follow, allowing sufficient time for the muscles to reconstruct, rebuild, and strengthen. In conclusion a summary of the foregoing of "How Should I Train" actually depends on the individual, his experience and what he wishes to accomplish with his training. If he's a beginner he should follow the outline given herein, whereas the 'specialist' should also examine his training on the points presented here, if progress hasn't been satisfactory of late. Furthermore, the person bent on combating obesity should benefit from the suggestions given here - to include a complete program and specialize at the conclusion, while devoting alternate days to such movements that react on those parts he favors to reduce. Reducing, however, can include an advanced man, whose years of inactivity caused him to become overweight, as well as the beginner, who has never done any type of exercise. 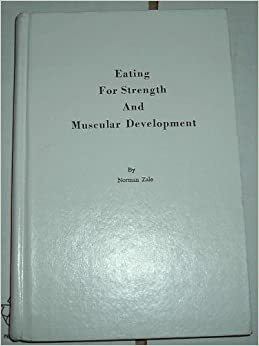 Or, the advanced bodybuilder who has sought bulk and power for a long period of time and now seeks to become lean yet retain his muscle [see upcoming article - From 415 Lbs to 223 Lbs - And The Mr Universe Title - Bruce Randall, by Joe Weider]. All should train according to their ability and demands, but increase the tempo of their training only gradually and when their physical condition has improved sufficiently to permit more intensive training - not before. If these suggestions are put into use, beginners and advanced men should be able to reach their goals more surely and more quickly. - Editor's Note: Marvin Eder, unique and unparalleled paragon of superhuman strength and physique, who inspired Bill "Peanuts" West, Pat Casey, and all of today's power champions with his fantastic feats of strength far back in the 1950's, when such power was undreamed of, still stands as one of the most amazing and inspirational powerhouses of all time. This unique article, embodying his principles and concepts of advanced training for power and size with forced reps will give a tremendous boost to your training, opening new vistas of size and strength to you. 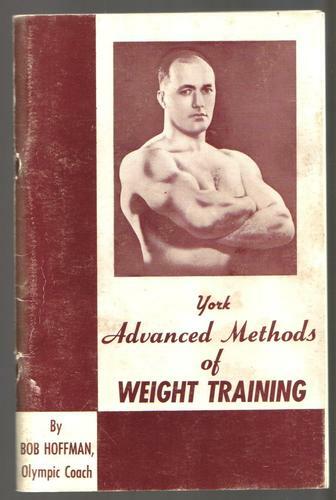 Marvin, who wrote this article in Jan/52, trained with Joe Weider at Goldberg's Gym and carried out the pioneering experiments which helped perfect the Weider training principles, and aided in their popularization. We expect the beginner in bodybuilding to make fast gains during his early training. His exercise-starved body responds quickly to modern scientific weight training, and it is not unusual for a beginner to gain as much as 30 lbs of bodyweight and 2" on his arms in a month's time. Many Weider pupils have done this, and we have written up a number of such cases. However, when a mighty champion, a man packing 190 massive pounds of cut-to-ribbons muscles on a 5' 9" frame makes super-swift gains in only a few workouts . . . THAT'S NEWS! Well, friends and neighbors, that's what big Marv did. In order for the reader to fully understand why Marvin's great gains in a few workouts are so significant to the serious bodybuilder, it's necessary to relate some details of Marv's training career. Marvin has just turned 20 years of age. (Marv's great strength and development at a youthful age were years ahead of his time, anticipating our many youthful champions of today. Marvin was World's Strongest Youth in his time, just as Dave Draper is today.) 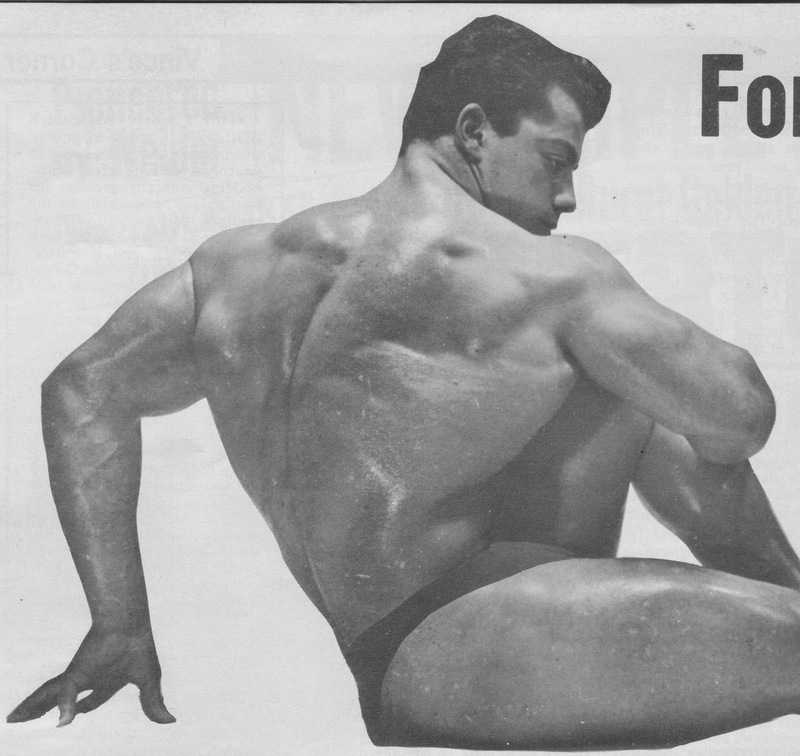 For six years he has been a bodybuilder, and three years ago (1949 - Ed. note) he won his first big title, that of Jr. Mr. North America. At the time of his winning this title, he weighed about 170 lbs with a 16" upper arm (which later went to 19 with the application of advanced Weider methods - Ed. note). It was characteristic of Marvin to stay in razor-sharp shape at all times, the type who gains slowly, but shows spectacular cutup definition at all times. Each added fraction of an inch of muscle shows up clearly, because there is no subcutaneous fat to hide definition. Since winning his first important contest, Marvin has won numerous other titles, gradually adding more size and power to his body with years, until last summer at 190 lbs he tied for 3rd place in the 1951 Mr. America contest. His massive and shapely arm measured 18.25" at that time. During recent months, those directly following the Mr. America contest, Marvin's measurements remained fairly consistent and those who saw him felt that he had reached the absolute maximum of muscular development for a man of his height. In looking at him, you have to agree that it is hard to imagine where he could find room for any more muscle on his body. His arms in particular appeared to be fully developed, for the sweeping muscular contours and deeply etched definition combined with short bone lengths create an appearance of massive size so that one would think further increase to be impossible. While Marvin's measurements remained about the same during these months, his power definitely was increasing, for he went up to 300 lbs in a standing barbell press, and made 432 in beautiful form in the bench press. Both these lifts were made with power to spare, with evidence that more could be expected in the future (Marvin ultimately reached the truly incredible level of 510 strict bench press and 520 floor press at 198 bodyweight, by the use of Forced Rep training and the use of other advanced Weider power training principles - Ed. note.). It is natural for a man to continue to grow stronger, even if there is no increase in measurement or bodyweight as he approaches fuller maturity, so I was not surprised to find him breaking records regularly in his training. But Marvin was not satisfied. He is a modern bodybuilder, one who believes in the latest bodybuilding methods, such as the set system, super sets, flushing, quality training and so on. He has used them all in his training and each has helped him in power and development. He was not satisfied with his achievements, and so experimented with different training methods, searching for the key to size and strength (bodybuilders in the Weider era of bodybuilding don't have to flounder around for techniques of bodybuilding, because the Weider Research Clinic has done all that for them,and continues to work at developing new and better methods of building muscle and power - Ed. note.). Imagine my surprise when Marvin walked into my office and said . . . "I gained seven pounds bodyweight and 1/2" on my arm in six workouts . . . two weeks time in all." Remember, this is Marvin Eder, the man who didn't gain fast, beside which he was already a champion of power and a bodybuilding titleholder. Asking Marvin to take off his shirt, I took out the absolutely accurate tape I keep in my desk drawer, pulled it snugly around his tensed upper arm and saw an 18.75" measurement! A full half-inch larger than it had ever been before. Please note that I am talking about COLD measurements . . . Marvin had been able to pump up his arm close to 19" during workouts, but never had it been over 18.5 cold until just now. Sensing a story, I took out my notebook and pencil, asking . . . "How did you do it?" When Marvin speaks I usually just take notes and listen, for he knows what the readers want to learn and I seldom have to ask questions. So, form this point on, let me quote you the words of Marvin Eder as I took them down . . . Forced reps is the answer to my recent gains. After being stuck at 190 lbs and an 18.25" arm for nearly four months, I was getting discouraged. I tried performing more exercises, working out more often, taking layoffs, eating more heavily, getting more sleep and everything else that has helped me in the past. I just couldn't budge. Then one day while practicing heavy bench presses, I asked Artie Zeller and Abe Goldberg to spot me with the weights. I made 4 reps nicely and on the 5th found myself stuck. "Force it out!" roared Abe, and both he and Artie placed their fingers on the ends of the bar, giving me just enough lift to complete the repetition. "Help me with another one," I said. They did. "Another one," I grunted. And they did, making 7 reps, 4 done in regular style and 3 done with the forced reps method, with just a little lift from them to make the lift possible. When they took the weight from my hands and I stood up I looked in the mirror, I had never before seen my arms, shoulders and pectorals so pumped and bulging. Suddenly it hit me. Forced Reps could be the answer to further muscular gains. That workout I did 5 sets of forced rep bench presses, 5 sets of forced reps strict barbell curls and 5 sets of forced reps lying close grip triceps extensions. It is hard to explain the feeling I had in my muscles. It as as though there was a vibrant burning action, deep inside the muscle tissue, pumping the arm full of new power and fullness. The next morning I measured my upper arm and it was 1/4" larger than ever before. At this point I interrupted Marvin. You and I know what forced reps are, but some of our readers may not be familiar with this term. Will you explain the term, so our readers will understand what you mean? Once again, from this point on, I am quoting Marvin's words. Forced reps are done in this manner: you select a weight with which you can accomplish 4 reps unassisted. Then you have two assistants stand at the ends of the bar, and when you get stuck and can't complete a repetition, these assistants give you just enough help to complete the rep. It is from this that we get the term 'forced reps'. They must help you evenly, exerting equal pressure on each side, and give you just barely enough to complete the rep. The help they give you must vary. By this, I mean that they must watch you closely, giving a little more help when you reach a real sticking point, and a little less when you have passed this point, and your muscles have more strength because of the more favorable position. In this way you do not limit yourself to a poundage that you can handle only in the sticking point of the exercise, for you can use a weight which will give the muscles a complete workout over their full range of motion, demanding from them maximum exertion at all stages of an exercise. It is because of this maximum exertion principle that certain sections of a muscle are more completely stimulated than before and naturally a more complete development of size and strength throughout the entire muscle results. Up to this time I have only employed this forced reps principle in the wide grip bench press, lying close grip triceps extension and the strict standing barbell curl. In just 6 workouts, covering 2 weeks, I have gained 1/2" on my arms and 7 lbs bodyweight. (These gains are even more remarkable when you consider that Marvin Eder didn't have our "Crash-Weight Formula #7 or Super Pro 101 to work with. With their help, his gains would have been much higher - Ed. note. You just gotta love the hard sell here!). 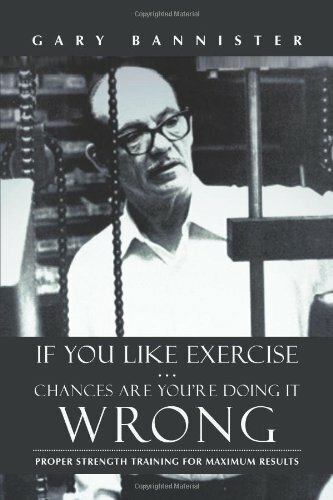 I expect to try the principle on other movements later on, but for the moment, because of the severity of this type of exercise procedure, I feel that it is best to restrict it to only a few movements. The above is the story about forced reps as related by Marvin Eder to me. It is another miracle of modern weight training which will once again help many bodybuilders who have been stuck in measurement and power and need something new and more advanced to make gains again. There are some misunderstandings about this method in some people's minds that I would like to clear up now. 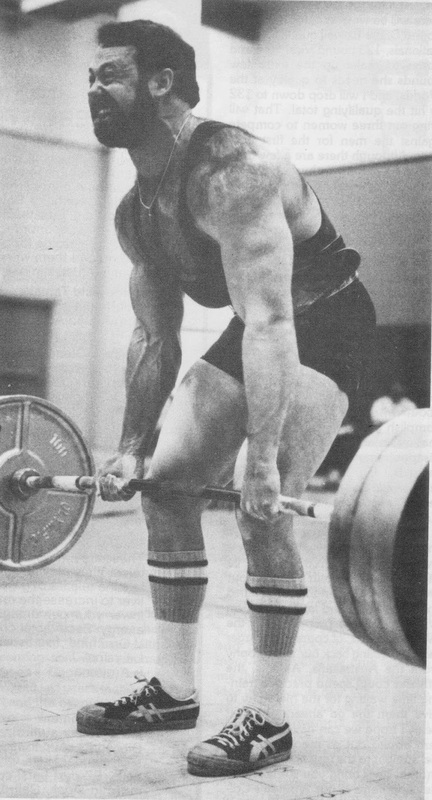 To begin with, forced reps training was advocated by Weider some time back. It has been used with benefit by Reg Park and other top bodybuilders, all of whom agree that for the advanced men, the ones near the peak of their development, such a system of training brings unusual results. You should use about 20 lbs more in the prone press with the forced reps style than you can use in the unassisted style. The reps should be low, about 7 for each exercise, and the sets rather high, about 5 sets per exercise. Don't try to perform more than 2 or 3 such exercises in any workout. While Marvin feels that forced reps are very advanced work, and only for the extremely advanced man (with modern Weider supplements and new nutritional knowledge you need not be a very advanced bodybuilder to use forced reps, as these advancements help you recuperate faster and build more muscle quicker - Ed. note. ), there is still a strong possibility that other bodybuilders, those who have found themselves stuck in their training, could benefit too. There is no reason why any bodybuilder, apart from the total beginner, shouldn't try forced reps. If they fail to give him gains, they are too advanced for him and he should cut them out of his training. I personally believe that most bodybuilders will benefit, provided they use some common sense and practice the principle in only a few exercises, such as the bench press, squat, biceps curl and triceps curl. I'll let you readers in for a scoop now. 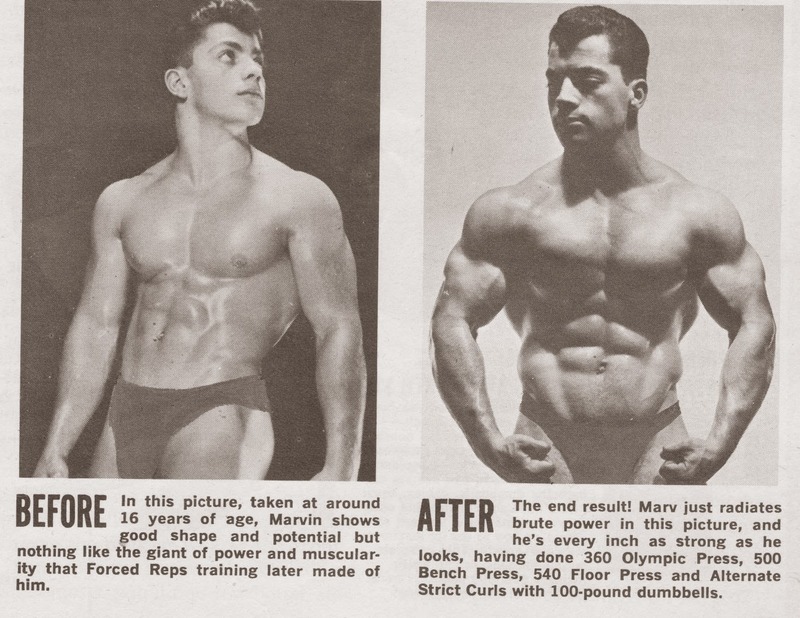 Both Reg Park and Marvin Eder have promised me that sometime soon they are going to follow an advanced Weider program of forced reps, SUPER SET STYLE (they did try it, and made even greater gains on it, which catapulted them to world fame - Ed. note). This, to my way of thinking, would represent the ULTIMATE in exercise severity and I hope to have a report on this soon. 1) Select only three upper body exercises to begin with. Bench press, barbell curl, and lying triceps extension being good ones. 2) Use a poundage you can handle for 4 or 5 reps unassisted. 3) Have two training partners, one standing at each end of the bar, ready to give you just a little help in raising the weight when you get stuck. 4) Perform a total of 7 reps, forcing out the last 2, and from 3-5 sets of each exercise. 5) It's very easy to overtrain with force reps, so be sure to get lots of Vitamin C from bioflavinoids, protein, and sleep. 6) Don't make the rest of your program too long, rounding out your routine with 6 to 8 exercises for the other parts of the body, performed the way you always do them. 7) Don't continue the forced reps program for any bodypart for more than a month at a time -- rest -- hit any other area or two -- rest again for a few weeks -- and go back to the curls, extensions and prones. And watch your muscles grow . . . Grow . . . GROW! 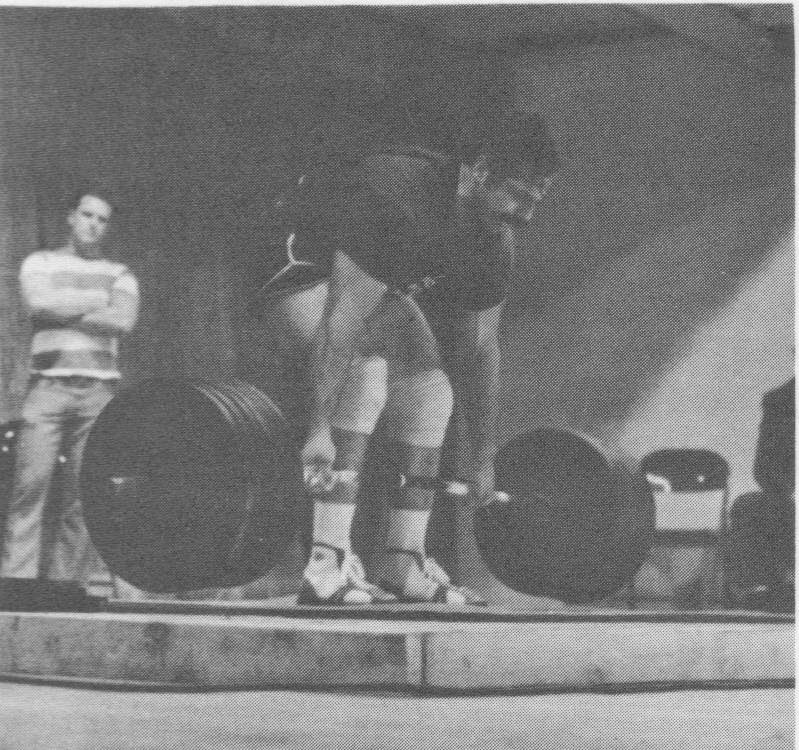 Note Footwear on Both Lifters. Like the finer aspects of any sport or any competitive lift, the deadlift, when performed correctly, should be considered an art. Too many times I've heard our most important lift oversimplified into just 'picking it up off the ground'. Remember, this is the lift that wins contests and the likes of Inaba, Gant, Crain, Bridges, Thomas, Cash, Gamble and Kaz have all hoisted record poundages. 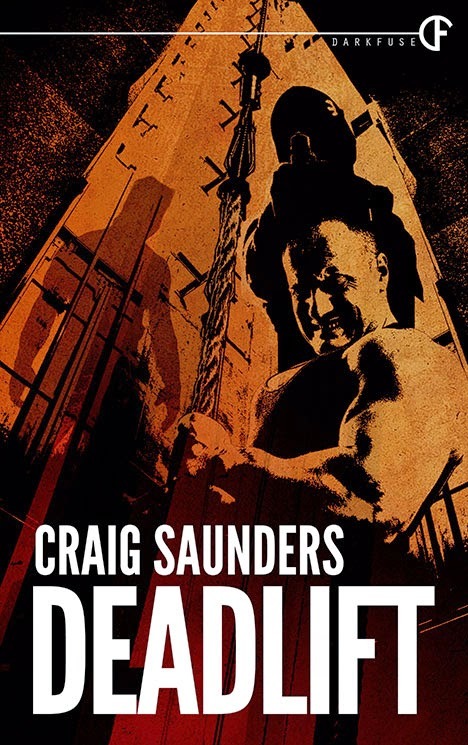 An interesting note is that Inaba, Crain and Bridges are squatters by body build, but through correct form and training have excelled in the deadlift. In the following article I will explain correct training for the deadlift given the different body structures, which lead to the implementation of either conventional deadlift form or the sumo style. It is safe to say most people should use conventional form. The ideal body structure is that of Lamar Gant: long legs, long arms, short torso. A great deal of back is used in the lift, complemented by the quadricep, glute, and hamstring. Even the powerlifter on non-optimum 'average' build should not forget that the back muscles are, as a group, the strongest in the entire body. Don't be afraid to use your back; the key is conditioning and foundation. Before structuring your training routine, we have to analyze the biomechanics of each style and the muscles involved. 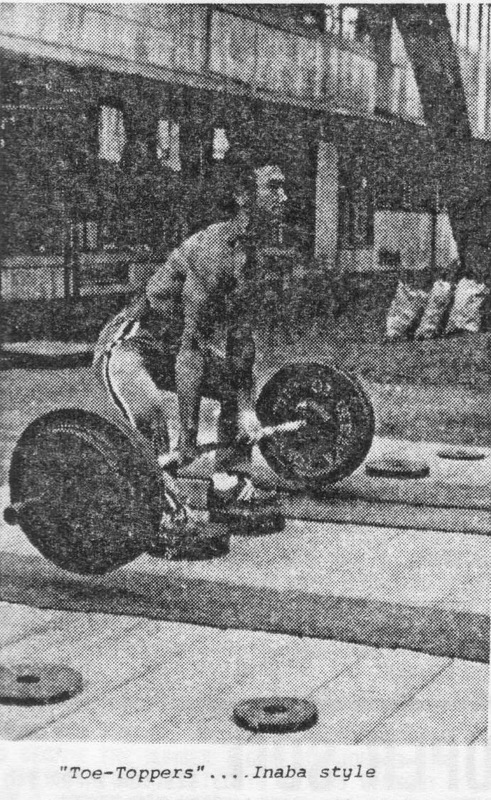 Correct execution of conventional form has the lifter pulling off the ground with legs bent to 30 degrees above parallel, back slightly rounded, and head forward. There should be initial flexion of the hamstrings and as the pull starts the only contraction should be with the glutes, hamstrings and to a degree, the quads. This makes the movement 'appear' to be a leg lift to the knee ALTHOUGH IT IS PAST THIS POINT THAT THE ERECTORS TAKE OVER ALMOST TOTALLY TO LOCKOUT. The two most common mistakes we see that deviate from this form are pulling in stiff-legged position below the knee and trying to shrug lockouts. The first is caused by lack of leg and back strength to keep correct form up to the knee and an appropriate comment on the second is that, to a large degree, we do not even use the lats and traps isotonically in the deadlift. An example of a 10-week training cycle in conventional style follows. We are assuming a max of 570 lbs going into the program and the goal is 600 in the meet. 460 x 6 reps x 4 sets. Light deadlift week, 405 x 8 x 4 sets. 490 x 4 x 3 sets, 470 x 6 reps for a fourth set. 520 x 4 x 2 sets, 500 x 5 x 2 sets. Light week, 405 x 8 x 4. Week 7 - 545 x 3, 530 x 3, 515 x 3, 500 x 3. 405 x 8 x 4. 570 x 2, 405 x 8 x 3 sets. no deadlift proper being done here. This routine is very basic for peaking. The key is the assistance work you do, the optimum stress load you apply (keeping in mind your squat workouts), and keeping correct form. The first 'tell tales' of going stale are bad technique and the weight feeling dead off the floor. Let's look at the textbook assistance movements and how we will modify them for the deadlift. 1) Shoulder Shrugs - are incorrectly done by pulling shoulders to your ears or by rolling shoulders in a circular motion. The deadlift modifies this to a stretch down to the knee and a contraction back to the lockout position. There should be no up or rolling movement. Do as if simulating a deadlift. Your traps will grow thicker, not taller, with this variation. 2) Iso-Shrugs - Put the bar on the rack 6 inches from lockout. The objective here is to pull your traps up and back as far as they will flex, dip under the bar and with an arched back lift the weight with just your legs. This is an isometric exercise for the traps. The idea is to work up to a weight where the traps finally can't maintain their flexed position and drop. This is excellent for strength. 3) Cable Rows - Best on the low pulley; use a deadlift width grip and pull low, to the belt buckle. This preempts the biceps and isolates the lower lats for thickness, and also in the critical deadlift position. 4) T-Bar Rows - Crouch down into the deadlift position for this one and maintain the bent body position during contraction. Pull low to the belt also. 5) Lat Pulldowns - Although fine for bodybuilding, this exercise is irrelevant for deadlifting. You do not pull deadlifts down, you pull them up. The greater emphasis here is on the assistance work, which strengthens the stabilizers and isometrically involved muscles. The target muscle training, i.e., for the erectors, glutes, hamstrings, comes directly from the powerlift itself. Because lower back burnout is our weak link, it is best to use fewer heavy sets of deadlifts, great workload volume on assistance work, AND MAINTAIN CORRECT FORM AT ALL TIMES. The sumo style deadlift is for the specialized lifter. Give or take few exceptions, this is recommended for a person who is built for wide stance squatting, out-squats his deadlift, and whose lower back is, relatively, the weaker link of the muscle groups involved. Mike Bridges executes this stance brilliantly. Reflecting back on Bridges, Inaba and Crain, these men all set world records in the squat long before they broke records in the deadlift. (Poor Michael - only an American record.) They have helped to pioneer the sumo stance, but the layman should be careful to note their unique specialization. The object of the sumo stance is to use your strong points of the squat and minimize your weaknesses (for whatever reason they exist) in the deadlift. With feet wide and toes out, the hands are usually placed half on the knurling and half off. The lifter will then arch his back, head looking up, and squat down to about 30 degrees above parallel for the pull. Correct back position must be maintained throughout the lift. The muscles being used are the glutes, hamstrings, adductors and to a small extent, the quadriceps. Here, the erectors are used only in an isometric capacity, just like the wide stance squat. The most common mistake we see here is failure to maintain an arched back throughout the lift. This is usually caused for two reasons. One is that the person should be using the conventional style instead, with this stance unknowingly giving him poor biomechanical leverage. The other is the 'anxious lifter syndrome'. With sumo form, the slowest part of the lift is to clear the ground. A sacrificed body position at this point will get the bar going, only to experience failure at the knee. Regular Deadlift, 400 x 10 x 4 sets. Isometric Shrugs and Cable Rows. Regular Deadlift, 420 x 8 x 4 sets. Regular Deadlift, 440 x 8 x 4. Regular Deadlift, 460 x 6 x 4. Regular Deadlift, 480 x 5 x 4. Wide Stance Light Day, 405 x 6 x 4. Sumo Deadlift, 450 x 3, 475 x 3, 500 x 3, 525 x 3. Wide Stance, 555 x 2, 530 x 3, 500 x 4 x 2 sets. Sumo Deadlift, 585 x 1, 405 x 6 x 4 sets. Bodybuilding only, no deadlift proper. Even though you are best suited for the sumo style, you should not train sumo, only peak that way. The reasoning is such: if all you do are wide stance squats and sumo deadlifts, then you really never work your erectors, which we have analyzed as your weakest link. My philosophy is this - you lose off of your weak points, but you win off of your strong ones. So train the deadlift conventionally for reps, getting that foundation where you need it. Peak the way you are biomechanically superior, keeping in mind, however, that your back is not being worked isotonically. Also take a light day in the 4th week transition when you change styles; not only is there a technical adjustment, but also a change in deadlift psychology. Here are a few tricks of the trade that may help you also. For the conventional style deadlifter, I recommend an even tighter suit than you squat in. Picture this: the squat suit gives its support at parallel but we only drop to the 30 degree mark for the deadlift. By taking your same squat suit and shortening only the inseam, the suit will then 'catch' sooner for that support. Some people comment that they can't get their shoulders up with a tight suit but as we discussed, there is no shoulder 'shrug' involved, if done correctly. Another trick is to spray antiperspirant on your palms before you warm up. If you've ever dropped an important one, this will ring a bell. Lastly, I wear a special shoe that has its sole/toe built up in the front (see photo). This shifts the center of gravity backward, through the torso, which with the hinge effect of the body reduces the stress on the lumbar area. I hope this is of help in determining your optimal approach. Remember, sumo is great, but most people should not use it. Don't overtrain the deadlift, but rather put emphasis on strength assistance work and always maintain good form. 2 How could I have got it so wrong? 4 How do champions’ paths differ? 7 Are younger siblings more likely to become champions? 11 From passion to persistence, perfection and obsession: How does personality shape champions’ paths? 12 How do critical episodes shape champions? 13 Broken bodies, broken minds? 14 What is in a champion’s mental toolbox? 15 Learning from defeat: Rhetoric or reality? 21 Do champions think differently about pain? Detoxification programs, as described in the previous chapter, are the most effective ways of helping your body to properly assimilate the food you eat. After completing a detoxification program you feel so good that you would like to continue on for another day or even week, but you realize that this is not possible at the present time. You feel great, your skin glows, little blemishes and injuries have vanished, your waist feels taut and small, people tell you that you look different; they can't explain exactly what is different about you but they say you have changed, and this makes you feel even better. What can you do to maintain all you have gained during your detoxification program, to keep felling and looking better than you have ever looked before? You realize that you cannot follow a detoxification program indefinitely because, due to the lack of certain nutrients, principally protein, great strength and muscle size is impossible to develop while on a cleansing program. Many nutrients are required by the human body and you would suffer if any of these were missing from the diet. However, there are certain nutrients which are valuable not because of what they supply to the body, but rather what they take away from it. These are substances which you must make every effort to include in your diet daily. These are the complex of natural substances known as adsorbents. The saying 'an apple a day keeps the doctor away' shows how far back into nutritional history these natural adsorbents go. You have no doubt used that expression but have probably never wondered why. One does not have to go far to find the answer. Unlike folk lore which stated that scrapings from the top of an apple cured constipation, diarrhea, modern science says that it does not matter which part is used, the whole apple can cure both. This is because of a natural cellulose which apples, and a variety of other foods contain, called pectin, the ingredient in preserves which makes them gel. Pectin is not digested by humans. If it were, it would lose its physiological effects because it owes its benefits to a physical attraction which its ultra microscopic particles provide. However, pectin is digested by the acidophilic bacteria in the colon, which utilize it as food. This encourages the growth of these friendly bacteria in the intestines which enhances its normal environment. How does this substance, pectin, work? If ordinary sand is held in the hand, it sifts gently through the fingers. When the same sand is glued on a piece of paper, there is great increase in the abrasive effect. Similarly, when pectin assumes the gel form in the intestinal tract, while smooth and soothing, the position held by its particles literally acts to scrub clean the intestinal walls. Actually, what happens is this: the suspended particles are held in place by ionic electrical charges which attract toxins and other materials to their surface, precipitating them and causing them to be removed in the normal elimination. Why is this intestinal cleansing action so important? Much of the intestinal tract is covered by tiny protuberances called villi. There are estimated to be about five million of these tiny, hair-like structures, which have the duty of absorbing food after it has been digested. If these villa could be flattened on an even surface, the 'skin' of the intestinal tract would equal about five square yards, about five times the area of the external body surface. This becomes even more impressive when we consider that this area can be a junkyard for debris resulting in rancidity, fermentation and putrefaction. Old time physicians would examine the tongue, and if they found it coated, suspected a similar condition throughout the intestinal tract. They often recommended the eating of bran to loosen the debris. It often worked, but not for the reasons they suspected. Today we know that a coated tongue is a poor indication of the intestinal condition; bad breath might be a better indication. The roughage they recommended was effective, no doubt, because it increased peristalsis, and like a dog shaking himself free of water, the intestinal villa threw off the coating which was stifling them. Though a rather crude method, this is still quite effective if you have not been following an extremely poor diet for years. A number of substances can be used to keep the intestinal tract operating at full efficiency after a detoxification program. Citrus pectin and magnesium gel clay are worthy products. Pectin has a particular affinity for absorbing gases and crystalline forms of toxins; thus it is most useful where fermentation and rancidity are involved. On the other hand, magnesium gel clay has a particular affinity for proteinous materials and is most useful where putrefaction is concerned. The combination of citrus pectin and magnesium gel clay is an excellent measure for maintaining the hygiene of the intestinal tract which was developed during your detoxification process. There is no roughage better than that provided by whole, raw foods. This means food which is eaten as is provided by nature. Juicing foods is fine for obtaining the vitamins and minerals stored in the cells, but where roughage is concerned, the raw food must be eaten in whole form. Roughage, or fiber, or bulk, whichever you choose to call it, is not an inert substance but a dynamic product which has a bearing on your health due to its physical and biochemical effects. You might look at a stringy piece of beef and think that the fibrous looking material is fiber. But that is not true. Meat, which can be completely digested, provides no roughage or fiber at all. The terms fiber, roughage, or bulk refer to all plant materials resistant to digestion by digestive juices of man. There are different types of fiber; some increase peristalsis, some absorb toxins and others absorb water from the intestinal tract. They even have the ability to reduce the amount of cholesterol in the blood. In experiments with African natives eating a high fiber diet, it was found that the average time between ingestion and elimination of food was 15 to 18 hours, a rapid transit time compared with that in the United States and England, where the average transit time is two to four days, and up to two weeks for some people. When food stays in the intestinal tract for two to four days and longer, toxic substances ingested with food combine with other toxins caused by bacterial action in the intestines and create problems. A slow transit time allows waste products to do their worst. When transit time is rapid, toxic compounds may be eliminated before they get a chance to accumulate and cause harm. Potatoes, eaten raw, are a food par excellence. They are both tasty and satisfying. They provide a rich source of potassium which has a marked cleansing effect on the intestinal tract when eaten in raw form, particularly before retiring. Add to this an apple, and by this simple expedient of following this procedure daily, you have one of the best intestinal hygienic procedures available. Drink buttermilk between meals for another intestinal detoxifying factor (lactic acid), or if you do not care for buttermilk, sauerkraut will do admirably. If you were to take only one kind of supplement, comfrey-pepsin would be the one to take. It would probably do you more good than any other pill. It digests the mucus that coats that walls of many men's small intestines. The mucus is caused by certain foods such as pasteurized milk, bread and many cooked foods. The mucus coats the villi on the wall of the small intestines and blocks the absorption of nutrients from food. Sometimes the mucus gets so thick and tough it is almost like a plastic film. Almost no nutrients can get through to the body and a hard training man could consume $500 worth of supplements along with a good diet and still get almost no value from them. He would be practically staving so he tends to keep eating more food including protein, and even digestive enzymes do no good because though the food is being digested it can not be absorbed, so it is passing out of the body unused. Comfrey is a very sticky, gooey vegetable matter. It tends to stick the enzyme pepsin to the mucus on the intestinal wall long enough to digest some of the mucus. If the tablets are taken for several weeks, this mucus will gradually be digested. The blood can then receive more nutrients from the food and transport it to the muscles where it is needed to provide material for growth and development. Sometimes it takes three months after a cleansing program to reach a state of health where maximum absorption is the rule rather than the exception. After that, it's a good idea to use the tablets once a year for three or four weeks to keep the mucus from building up. It has been found that every person examined who is overweight has a mucus problem, reports one doctor. This seems to indicate that these people are eating heavily of protein foods because their bodies require the protein, but they can only absorb the smaller carbohydrate molecules while the large protein molecules are blocked from being absorbed. It takes a but little know-how and initiative to contribute immeasurably to a healthy intestinal environment. If you will follow the suggestions here you have every right to expect to get the most nutritional value from the food you eat. 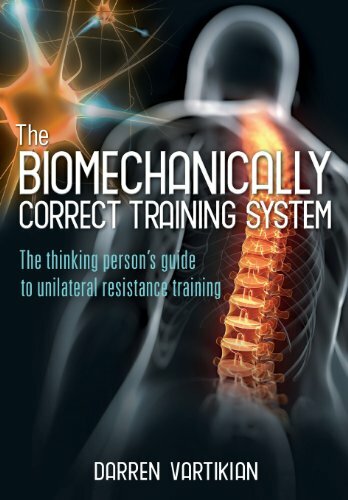 - In this extract from The Biomechanically Correct Training System, former IFBB Mr. Australia Darren Vartikian controversially warns against training in the way you're probably quite used to - bilaterally. No matter what the goal, the end result of any form of resistance training exercise should be about creating and maintaining a healthy state of mind and body. The body is designed so that its natural warning system of malfunction will activate - as pain, swelling and discomfort - if inappropriate resistance exercise is executed. Ignoring the warning system's signals will ultimately lead to varying degrees of short- and long-term structural damage. Traditionally, resistance-training exercise is executed in a bilateral fashion using the prime moving muscles on either side of the body. The barbell bench press, barbell deadlift and barbell biceps curl are just a few examples of common bilateral exercises. There is no doubt that bilateral training is a very fast way of achieving muscle size, power and strength. Unfortunately, the desired results can also cause collateral damage - structural injuries to muscles, joints, connective tissue and nerve fibers. There is also the financial burden to rectify related injuries (medical and therapeutic practitioner costs) and the psychological frustration due to physical pain or exercise restriction, which can be long term. 2) An imbalance of muscle development or strength and conditioning, ultimately related to inappropriate and inefficient movement patterns. 1) Exercising muscles bilaterally increases the compensatory effect, hampering one's awareness and eliminating the ability to correctly analyze strength, weakness and the injury potential of corresponding muscles on either side of the body. 2) It can lead to the formations of dangerous lifting habits, such as using accelerated momentum (through bouncing, swinging or thrusting of a weight) to try to overcome mechanical disadvantage. Moving a weight using accelerated momentum bypasses two of the body's natural protective mechanisms - muscle spindles and Golgi tendon organs - increasing the risk of injury. 3) It increases the potential for hyper-stimulation of the nervous system, increasing the risk of exhaustion or burnout to the body as a whole and necessitating the need for more rest. Consequently, progress is slowed. 4) Lifting greater weight increases training intensity, energy expenditure and the length of rest periods, making movement between sets and exercises slow. This leads to longer time spent working out. 5) The need for a safety net (in the form of a rack or spotter) is synonymous with bilateral training. Lifting heavy weights necessitates having someone close by in case help is required. This means either having to rely on a training partner or constantly having to ask someone for help (which may annoy the person asked). All bilateral muscles of the body function independently. In many instances, they do so during everyday activities such as walking, running, swimming, writing, eating and so on - all while using one limb at a time. Recognizing, therefore, what is already a natural process of independent function, the BMC Training System is built on the view that all resistance training should be executed in a unilateral fashion - one side and one muscle at a time. Unilateral resistance training allows a prime moving muscle to function in its most natural path of movement, accurately coordinating body parts to capitalize on leverage and balance so that replication of precise biomechanics can be attained for maximum results and safety during an exercise. This type of training is highly advantageous during instances when a prime moving muscle may execute more than one action or function, allowing the corresponding muscle on the other side of the body to work independently and efficiently, without competition or compromise. 1) Unilateral resistance training is an ideal way to introduce the elderly to resistance exercise, as it comes without the stigma of intimidation often associated with traditional bilateral resistance training - such as a fear that lifting a heavy weight may harm or injure. 2) It is also useful in rehabilitation after injury, providing essential, direct and specific control of muscle movement. 3) Unilateral resistance training defies any perception that resistance training is a time consuming, boring chore that will only cause acute or chronic injury. The most valuable benefit compared with traditional bilateral resistance exercise is awareness. Awareness includes knowledge about the strength or weakness, and overall function, of a prime moving muscle. This insight allows precise analysis, empowering an individual with information about related issues and areas of the body, and expediting assessment and comparison. Unilateral training transfers complete ownership of resistance weight used during an exercise exclusively into a prime moving muscle, heightening the need for greater focus, which in turn decreases the contribution from accelerated momentum. The reason why some injuries can occur in striving to develop balanced muscles is accelerated momentum. This generally occurs as a result of muscle exhaustion, imbalance in muscle strength, poor mental focus, or just plain ego. A classic example of accelerated momentum is as follows: an individual executing a barbell curl with too much weight begins to generate movement through the hips, back and shoulders to raise the weight, instead of the intended prime moving biceps muscles. Unilateral training keeps the prime moving muscle 'honest': it eliminates the lifting of unrealistic amounts of weight and places limbs, joints and muscles in the best possible leverage position so that optimal strength during an exercise can be attained. In addition, a muscle may carry out multiple actions, necessitating movement in varied directions and angles. Unilateral training accommodates this perfectly, accurately coordinating body parts free of restriction for optimal function and injury reduction. That same versatility enables a prime moving muscle to be isolated during an exercise so as to precisely target a contraction of aspects that relate to the upper, lower outer, and inner fibers; this increases the potential for complete development of a muscle's size and strength. Symmetry, in the context of resistance training, means that the muscles either side of the center of the body are similar in appearance (size and shape) and function. They are effectively mirror images of each other, thus improving overall balance and structural integrity of the body. Barring genetic factors, unilateral training enables superior muscle development. Time is a precious commodity most cannot afford to waste, making unilateral training the ideal form of resistance training for those with a busy lifestyle. A unique aspect of unilateral training is the allotted time of a workout. At face value, unilateral training might seem time consuming; in fact, the opposite is true. The isolating nature of this type of training means reduced resistance weight that, in turn, decreases the exhaustion of the body as a whole. This enables faster recovery and shorter rest periods between sets and exercises, resulting in a reduced workout time. Prevention of injuries is a critical and integral feature of unilateral training. This goal is achieved by distributing resistance weight and muscle-generated force through a natural movement pattern, which protects muscle, joints and connective tissue. Another element of injury prevention and balanced muscle development are motor units. A single motor neuron that connects to skeletal muscle fibers is referred to as a motor unit; it is the communication link between the brain and skeletal muscle, enabling muscular contraction. Skeletal muscles are made up of multiple motor units, making varied movement patterns a necessity, so that the total contraction and stimulation of a prime moving muscle occurs. This guarantees proper development. Unilateral training is the appropriate method to achieve this objective. Relying on another person to assist during a workout can be very frustrating. A time to meet has to be coordinated, and the other person needs to turn up on time. An even greater concern for many is asking for assistance from someone they don't know; there may be concern, for instance, about the individual's level of experience with resistance training, mental stability, and personal hygiene habits. Exercising one limb at a time affords the opportunity, circumstances permitting, of using the opposing limb (or other limbs not being used to assist during an exercise); this eliminates the burdensome need to rely on others. So remember, just because everyone else is doing it does not mean it is right. 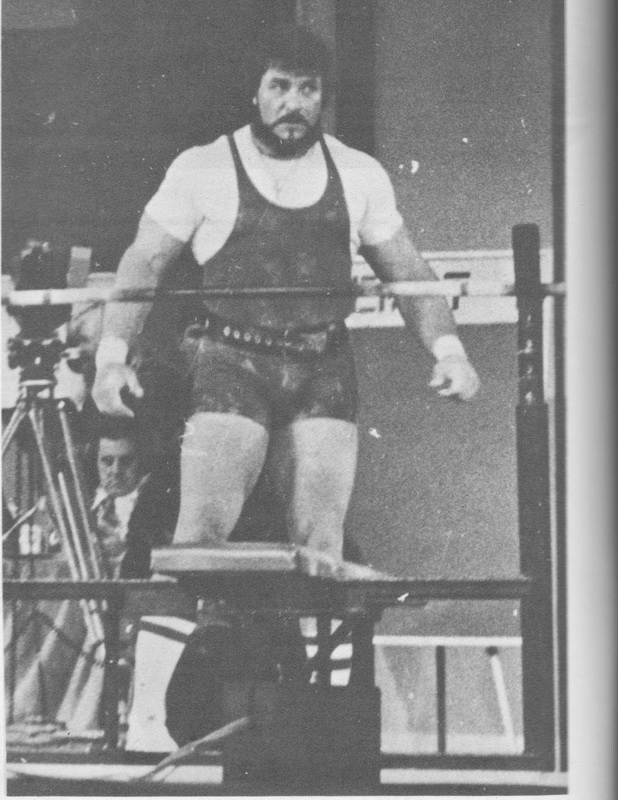 David Lowe is currently performing the heaviest unrecorded deadlift, performed outside competitions rules, or any rules, by holding the severed cable of a thousand-pound hotel elevator containing his wife and an undetonated bomb, while a killer in a sackcloth mask looks on, and a hit man holds a loaded gun to his head. David is no superhero, he has no special abilities other than mere human strength and the will to save his wife. He’s been holding the elevator for one minute and thirty-six seconds, bloodying his hands, tearing muscle fibers and cracking bones. But push him to his limit and he'll dig deep, find more. Because when everything is on the line, it's not about muscle anymore—it’s about heart...and never, ever, giving up on what you love. 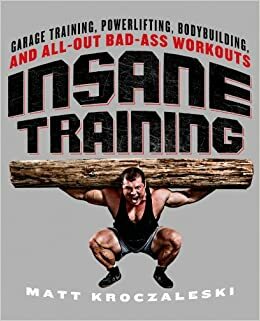 Insane Training is what Matt is famous for. His book of the same name is full of programs that will help every gym rat take it to the next level, whether that’s flipping a tractor tire 100 yards, deadlifting three times their body weight, improving athletic performance or puking in a bucket—this book has it all! This book will revolutionize the training of young junior and senior high school athletes, beginning athletes, and individuals interested in becoming physically fit. Present day strength training programs may be effective in developing strength but they also have many negative aspects that have prevented athletes from achieving their potential and preventing injury. The 1 x 20 RM strength training program not only resolves these problems but offers many more benefits than the present day training programs. Guidelines are presented on how to use the 1 x 20 RM program so that it is easy to follow and administer. The book is easy to read and written to give you a greater understanding of everything you need to know about strength training. Masters Training - Novice Division. Off-Season - Squat, Bench Press and Deadlift. The following training program is designed specifically for Master lifters and can be increased or reduced in poundage to accommodate varying strength levels. This program is appropriate for 'hard gainer' lifters of all ages. If you have recovery problems and can't seem to keep up with the workouts that some others perform, you will do well with this training program. As listed, the program includes only the primary lifts and none of the accessory work is shown in the layout. We wish only to give you a plan for spacing out off-season training so you can make good gains and not go stale. All accessory work needs to be tailored to the individual lifter and so is not included here. Individually tailor, adapt and change the program accordingly. Back - 1, Chest - 1, Legs - 3. It does not matter how often you need to work out each week because all you need to do is complete the next workout in sequence when you are recovered sufficiently. We recommend three to four workouts per week. If you work out an average of four times per week this routine will last approximately 12 weeks. We also recommend that you do not work out more frequently than five times per week to allow for enough recovery. Stiff Leg Deadlift - 115 x 6 x 3 sets. 185 x 3 x 4 sets. Good Morning from Half Squat - 65 x 5 x 3 sets. Close Grip Bench Press with wrists locked forward - 10 x 3 sets with 95-115. - 10 x 3 sets with 95 lbs performed very slow and controlled. Note - this is a day of accessory only and is designed to reset the stabilizing muscles of the upper back, shoulders, and torso and to pump and flush the bit muscles like lats and traps. Remember that this workout is designed to have more accessory work along with the primary exercises and that most of the accessory work is done with light to moderate weight and high volume. We want you to take note of the varying of the routines so that your weeks are not all the same. In this way you will make faster and more consistent gains than with a steady, predictable routine of one bench, one squat, and one deadlift per week. If you include accessory exercises that address the weak points of the primary lifts, make sure you perform 3-5 sets of 6-10 reps with light to moderate weights to insure growth in your problem areas. Keep looking ahead to bigger numbers in your primary lifts. These are the lifts you want to increase. The efficacy of your accessory work is not strictly dependent on weight used. Psyching up and mental build-up for training and competitions was of prime importance to George Frenn, as was getting himself into a near-frenzy for big contest lifts. 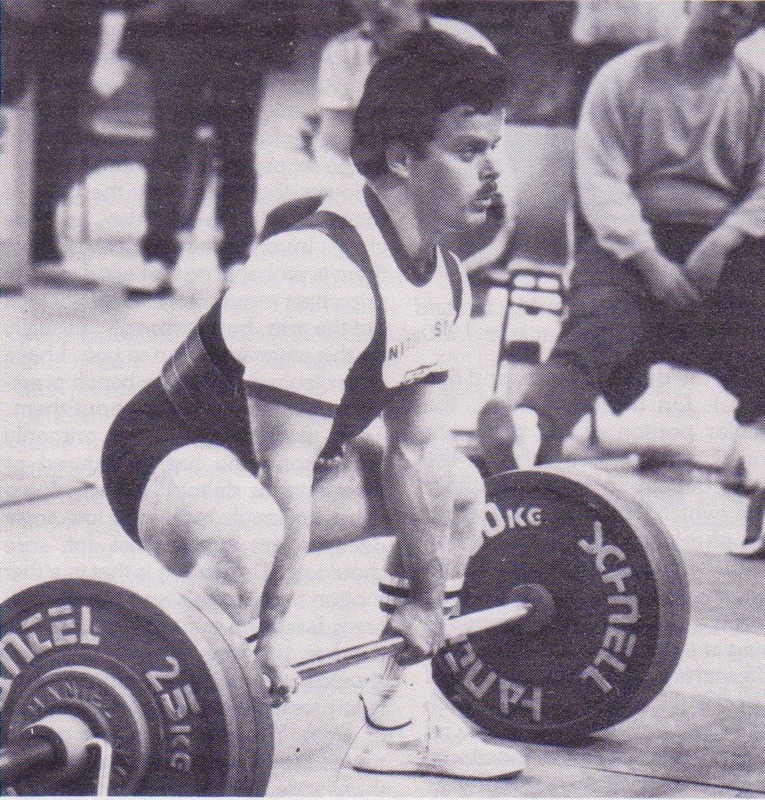 He has always defended the use of wraps, as an integral and necessary part of powerlifting. This, however, is not to say that he did or did not use more than the permitted amounts of wraps, as I have heard said. I saw him with his 819 squat at 242, and he didn't look too wrapped, and I have no reason to believe it was excessive. 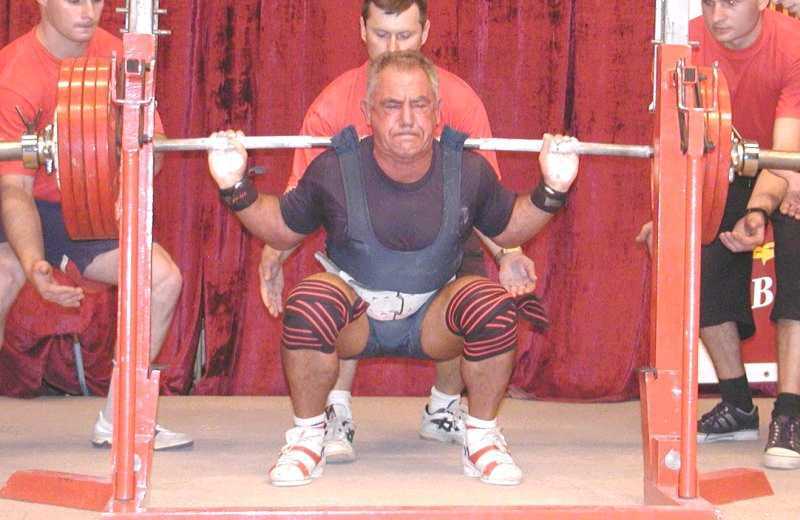 He was an incredibly powerful lifter with some incredibly powerful legs. George worked squats and deadlifts twice a week. Saturdays and Tuesdays. The Saturday workout was a real all out effort on both lifts so as to stimulate the kind of work and pressures he may have come under in a hard contest, thus making sure he would have the endurance and temperament to cope. The Tuesday workout consisted of bench squats and one set of deadlifts. "This was designed as a contrast and relief from the hard previous workout so as to maintain absolute keenness for the next Saturday effort. No workouts was ever taken lackadaisically, but were always concentrated serious work, especially the main Saturday one. 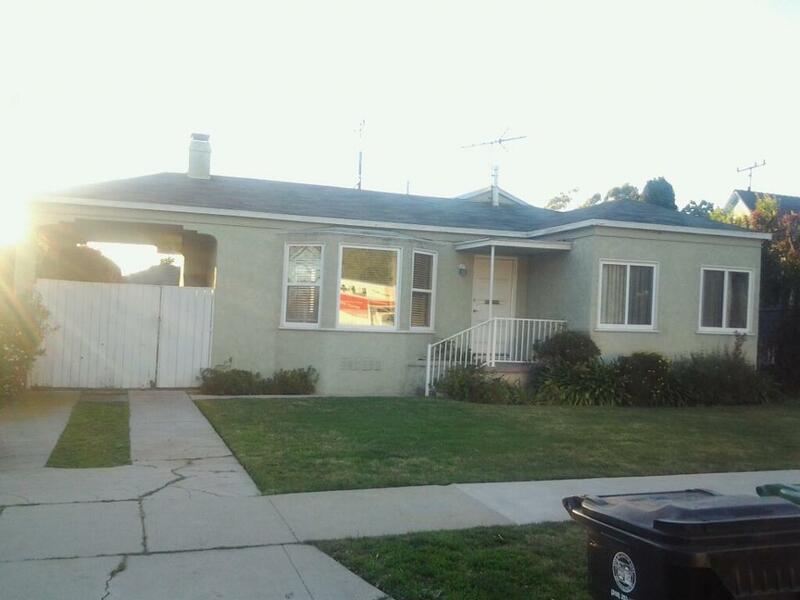 George generally trained at the Westside Barbell Club, which was a double garage converted into a purely power gym at the back of Bill West's house. 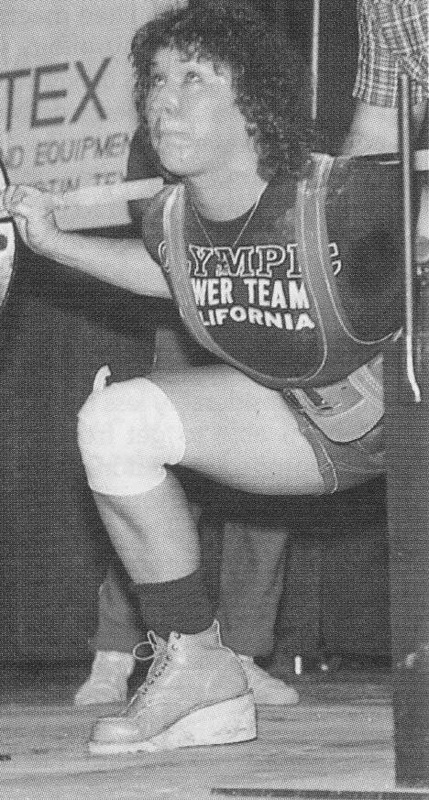 Most of the top Los Angeles and West Coast powerlifters trained there from time to time, so a good atmosphere was generally guaranteed. Three typical workouts just prior to his 819 squat and missed 785 deadlift attempt are outlined below. Every set performed is included and the underlined lifts indicate when knee bandages were put on. The Bench Squats were done to quite a low bench, pausing at the bottom, rocking slightly backwards, so that very little weight was actually taken by the feet, and then rocking back again and driving upwards. All workouts followed this sequence, increasing the top poundages or adding an extra heavy set when feeling capable. Having stayed with George for 3 weeks, enjoying his mother's fabulous hospitality, I can vouch for the fact that he ate a considerable amount of food, and drank a fair bit of milk whilst training hard. Even though training hard for the squat and deadlift he would still keep in trim for the hammer throw with a couple of sessions on the track. These would consist of some easy practice throws and a little running, which probably helped keep his physique in good trim also. Being a physical education teacher, he found this easy to work in during the day. Perhaps the most important aspect of George's training to emphasize once again is that he treated his lifting very seriously, putting it absolutely number one in is life.